Photo: Arrival at the cave entrance. One of the prime attractions of Thailand’s Andaman Sea, Tham Morakot leaves visitors in awe. Browse places to stay in Ko Muk on Agoda.com. Free cancellation. If you don’t mind swimming or paddling through a dark sea cave, you’ll be treated to a hidden beach unlike any other that we’ve experienced. 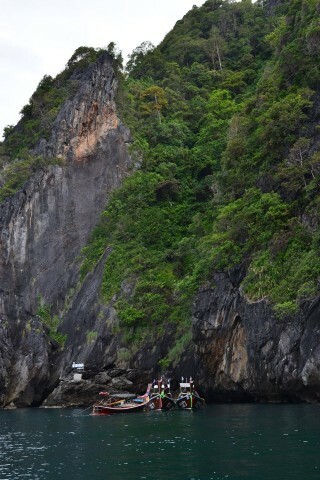 Setting out from Haad Farang, our longtail boat chugged past the immense limestone cliffs that make up most of Muk’s southern and western shores. Within no more than 15 minutes, we arrived at what looked like a typical patch of the rocky coast save another anchored longtail and a sign attached to a rock with the words, “Tham Morakot”, scribed in Thai and Roman scripts. Even when jumping into the sea-green water, we couldn’t tell where the cave began—one of several reasons why visiting with a local guide is a good idea. With a waterproof headlamp strapped to his brow, our longtail driver dove in and motioned for us to follow. As we passed under the low-hanging rock that marks the cave’s entrance, we could hear a small child crying loudly up ahead. The 50-metre swim leads through a dark cavern with a roof that stands several metres high at low tide but submerges high tide. A fork in the waterway is another reason why it’s good to have a guide: take the wrong turn and you could get pinned against a dead-end wall by the current, which causes a menacing echo to resound through the cave. If you follow your guide closely and don’t suffer from claustrophobia or extreme fear of the dark, you’ll be fine. A faint flicker of sunlight grabbed the water’s surface after we passed the cave’s darkest section. A few more breaststrokes and we emerged into a magnificent cathedral of nature’s design, vast limestone cliffs wrapped around a small, perfectly symmetrical crescent of khaki sand. The clear water lapping gently onto the beach did indeed strike an emerald hue. Hidden amid Muk’s rugged rocks, this part of the Emerald Cave is actually a sinkhole that was formed many moons ago. Numerous tropical plants, vines and trees receive enough light to grow just behind the beach, lending the feel of a closed-off biome that also supports a range of birds and the occasional monkey. Locals searching for swallow’s nest, the delicacy served in Chinese bird’s nest soup, are said to have first discovered this “emerald sinkhole”. Decades before Tham Morakot caught on as a tourist attraction in the late 20th century, pirates found it to be the perfect spot to stash their booty. It’s easy to see why: the cave entrance looks like nothing more than another crevice, and getting here by land requires slashing through dense jungle before repelling down the rock walls that tower in a precisely 90-degree angle on all sides. Like something out of a film set in some remote paradise, this was one of the more captivating natural wonders we’ve visited anywhere in Thailand and beyond. The child who we heard crying earlier was now gleefully splashing with his boatman guide. We sat off in a corner, taking it all in, not regretting that we’d forgotten our diving bag (and hence our camera). We were able to share Tham Morakot with one small family of other travellers and our guides, but many travellers aren’t so lucky. It’s a major stop on the itineraries of countless boat tours from Ko Lanta, Pakmeng and other places, and arriving at peak times during high season will mean being shepherded through along with dozens of other people. The cave/sinkhole isn’t huge and would be far less appealing if shared with a crowd. This is one reason why we recommend staying on Ko Muk or the neighbouring islands of Ko Ngai or Ko Kradan, which will allow you to visit Tham Morakot privately, guided by someone who knows when it will be free from the crowds, the tide and the Chao Mai National Park officials who haphazardly charge foreigners a 200 baht entry fee. Before 10:00 is a good time to go, followed by late afternoon, though the boatman leading another trip slipped his passengers in during a 20-minute window when no one else was there, just after noon. A direct roundtrip from Haad Farang to Tham Morakot runs 600 baht (for the boat, not per person) and will go up slightly for four or more people. Expect to pay a bit more if coming from Ao Kham. Longtail boats can be arranged through resorts or directly with the boatmen on either of the main beaches. (See the Boat trips listing for info on other options.) It’s also possible to paddle in by kayak when the tide is right.